Nothing compares to great extra virgin olive oil, living here has taught me that. Possibly my favorite snack of all time can only be eaten in fall. Fettunta, a freshly-toasted slice of bread rubbed with a fresh garlic clove and covered in new oil, with a little salt if you want. Great olive oil makes it way in so many recipes, poignant as that last drizzle on top of a hearty soup or stew, topped on a salad or fresh veggies, or even in a simple cake. There are endless ways to use it, but finding the ‘real’ thing can sometimes be difficult in a world where even the supermarkets in Italy are lined with some sort of stuff they label as ‘extra virgin’ but is dirtier than a back alley in Bangkok. However the trick is to educate yourself first and seek out the good stuff. There is something about family business and traditions that catch our souls as consumers. We’d like to think that people care, and in Italy, I am amazed at how many people I meet that do. Gionni and Paolo Pruneti are two of those people. These two brothers are the grandsons of an olive oil dynasty (four generations!) based in San Polo in Chianti, Pruneti Oil. I had the chance to interview them last November, after getting to know their extra-virgin olive oil during a cooking class with my foodie friend Giulia of Jul’s Kitchen. Nico and I visited the frantoio (olive press) and met the dynamic duo, though they were very busy getting the 2015 production underway. I liked them so much, we ended up using their extra-virgin blends (an intense and mild version) for our wedding as personalized favors, which our guests (and us) loved. I still have a few bottles left and my god are they marvelous. Guys, can you tell me a little about Pruneti? Past and present and how olive oil consumption has changed today? The products were then collected and sold to the local market of San Polo in Chianti or Florence or sold directly from the farm. Upon out arrival, myself and Gionni, during the end of the 90’s was in conjunction with a major change of the way we all did business. More and more people bought directly from supermarkets and major retailers instead of the traditional habit of going directly to the manufacturer. These new habit changed the rules of the game. That’s when we decided that we had to get to know this new market and develop a more comprehensive activity. In the old days, we focused only on production. Instead with the way the market was behaving, we needed to talk more about our products, the quality, technical characteristics, labels, nice packaging to entice consumers. This helped us also to improve our technology itself, we invested in more modern production facilities and focused on creating a truly excellent high quality product. Now the company is distributed in all containing from Asia, America, Europe, Africa. I’m curious, why did you both decide to stay in the family business and not change careers? Was this truly both of your lifelong dreams? For sure it was the dream of a lifetime, this land is very contagious. As kids, we went to help our grandfather sow the fields, working and watching the plants grow. It is hard to break away from this rhythm. When we were in high school, we faced a different world, living in the city and meeting different people, learning new things. Instead of studying anything regarding the countryside, I chose to study economics and computer studies while Gionni did biology and chemistry. When our studies finished, it was difficult to think about doing anything other than the family business. We thought “lets throw our hats in the air and see where it lands” and it landed here, on our land. We were quite motivated, even with all of the struggles. Today, we are very much a structured business and it’s interesting to think how different it is from even 15 years ago, it was a lot of hard work. We are two Capricorns and our stubbornness has led us well, to look for challenges and not seeing obstacles. The ideas continue to flow and we evaluate them all. You guys are one of the few organic olive oil farms in Tuscany. 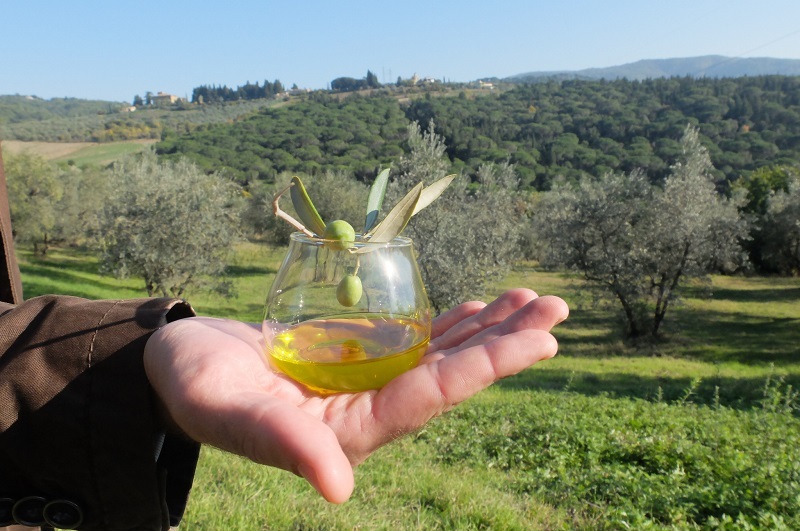 What are the methods used to be ‘organic’ and how does the territory effect the olive oil produced in your fields? Organic production is an overall choice of respect for the environment, in order to preserve the land, and our olives as best as possible. The organic production methods are based on vegetable or organic-base products for the treatments of the olive plants from pest attacks and fertilization. Because we don’t use aggressive chemical treatments, we get to see a wide variety of wild plants in our soils. 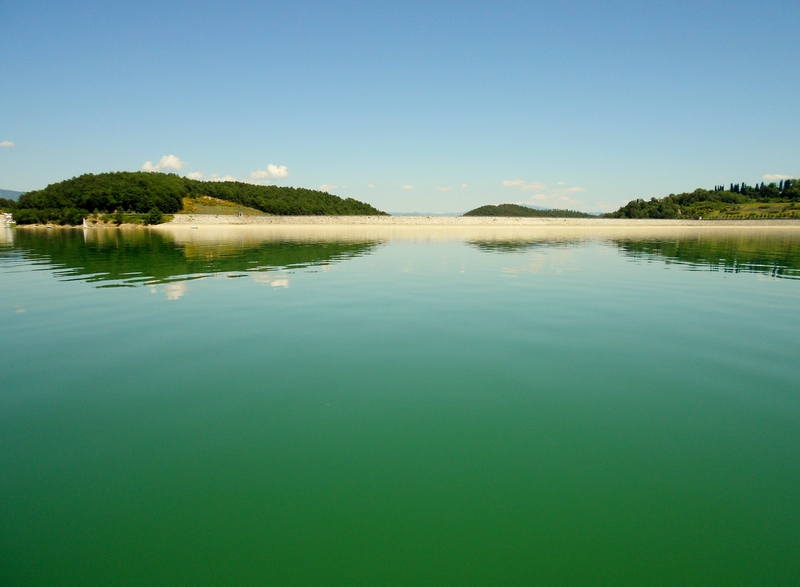 The land greatly influences the flavor of the flavor and aroma of the final product. Olives and grapes are amazing examples. Soil characteristics, subsoil, and many factors such as climate, the geographical area, everything leaves their mark in your oil. The same types of olives, in different contexts, can give different structure in the extra virgin olive oil they produce. We believe in the concept of high quality linked to the territorial characterization, and only use the types of olive varieties in Tuscany and Chianti Classico. Speaking of Characteristics. How would you describe Pruneti Extra Virgin Olive Oil? We produce nine types of extra-virgin olive oil, three monocultivar and a grand cru that is a blend of our single variety Extra virgin olive oils. 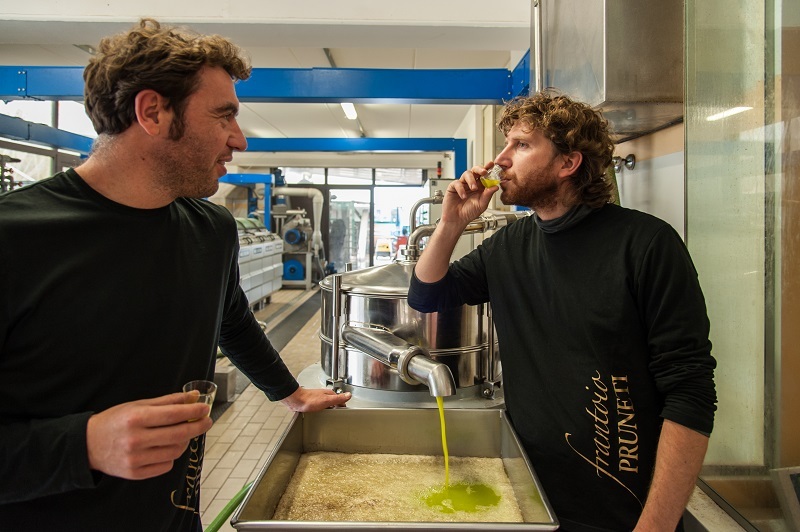 The five Pruneti Extra ‘virgin’ olive oil of the traditional collection are a blend of different oil intensities which have a diversity of flavors and aromas in wine and food pairings. They are obtained using twelves different olives that are typical for our area, 80% from the three main ones Moraiolo, Frantoio and Leccino which are mingled with various minor varieties also of the land (Pendolino, Maurino , Correggiolo, Leccio del Corno, Leccione). Making oil to us is an art which is why all of our single-variety extra virgin olive oils are dedicated to the arts. Each has its own extra virgin characterization: for example the softness of Leccino with herbal notes and pungent fresh vegetables. They moraiolo prevails with spicy and balsamic notes, those fruity almond, dried fruit, or sage and spicy black pepper. Frantoio stand outs with bitter notes of artichoke, arugula, spicy green pepper. What are some surprising truths about extra virgin olive oil that many people might know about? What should we all be aware of? 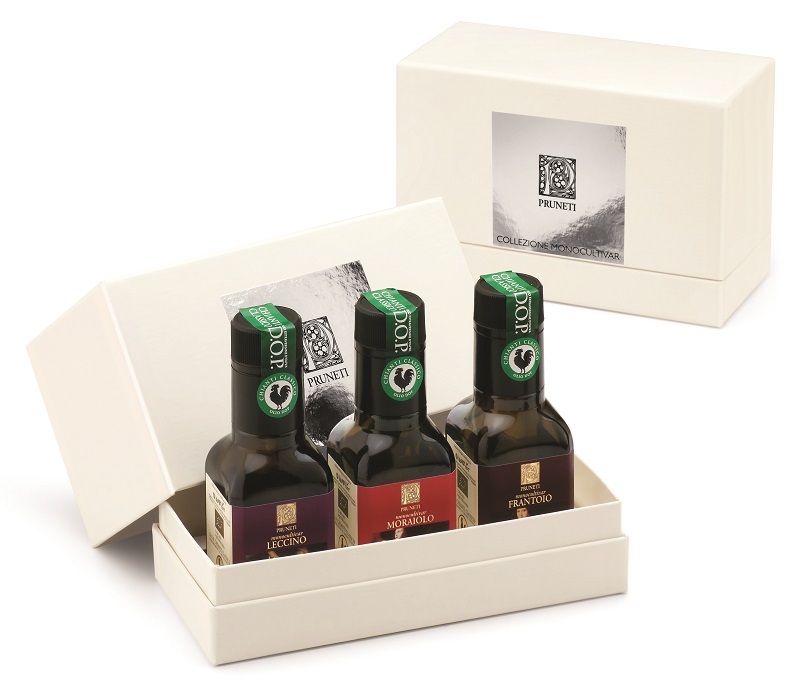 Despite the fact that extra-virgin olive oil is a very used product nowadays, there is actually little awareness of what distinguishes quality extra virgin olive oil from another lesser-quality oil. The way to know more is first by reading the label. For example, many speak of extra-virgin as being the ‘first pressing’ but this is a term used by marketers, not producers. Extra-virgin olive oil is made with a single pressing with mechanical methods using healthy olives, if there is a second processing, this is no longer olive oil. Another thing is ‘filtering’. 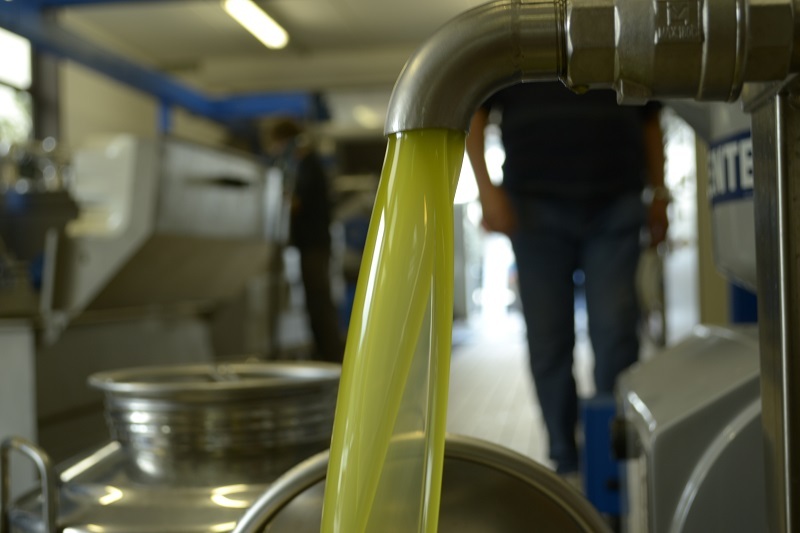 Filtering extra-virgin olive oil is necessary to increase the quality of the product. It is probable that unfiltered extra virgin olive oil begins to age early because the internal substances trigger chemical reactions that oxidize the oil. So ‘unfiltered’ is not synonymous for quality and authenticity as some commercial productions would have you believe. Also, another great truth that many must discover is that extra-virgin olive oil has a flavor! It’s not about the smell, but truly about the taste, which is why we always want people to come and taste the product for themselves. 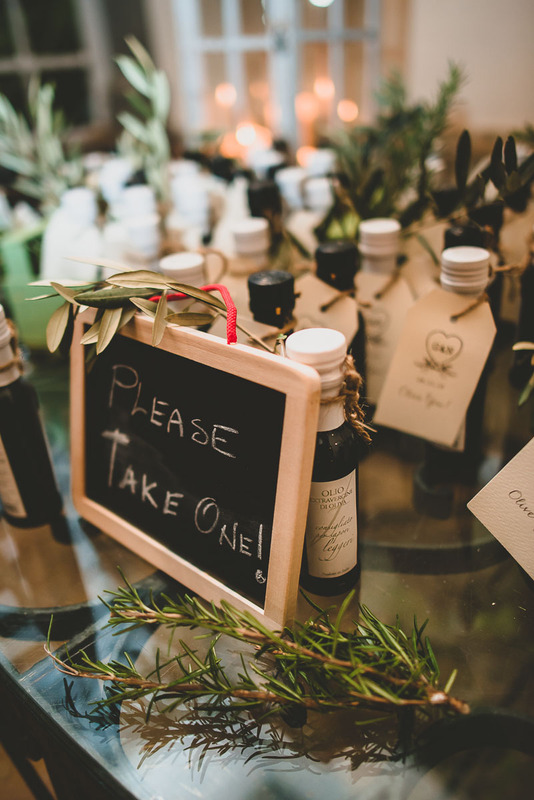 We have a large oil salon where we offer daily tastings, and help people distinguish different oils. It’s about characterizing the immediate flavors: fruity and balsamic, sage, rosemary, or the very earthy flavors of lettuce, artichoke and arugula, spicy notes of pepper. Also “trace-ability”, going back to reading the label and choosing a certified products. We have the guarantee of the IGP Toscano consortium and that of DOP Chianto Classico, assuring that it comes from this territory. Olive oil which is not certified can come from all over Italy and sometimes is mixed with olives from Europe and beyond. It’s up to the company to get certified so it typically means they want to be recognized for quality. I also recommend having a look at trusted guides such as Flos Olei, Le Tre foglie del Gambero Rosso, Monocultivar Expo, Ercole Olivario, Olive Japan among others. 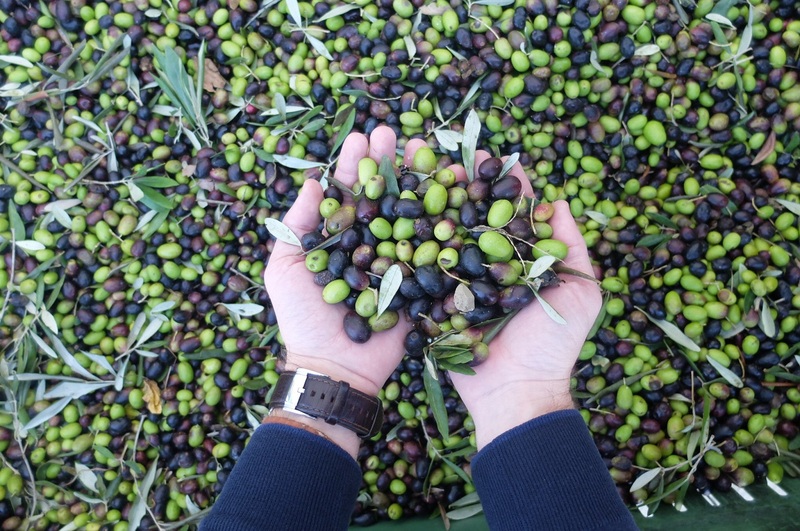 2014 was a bad year for olive oil, how did it affect your business considering the organic olive oil production? 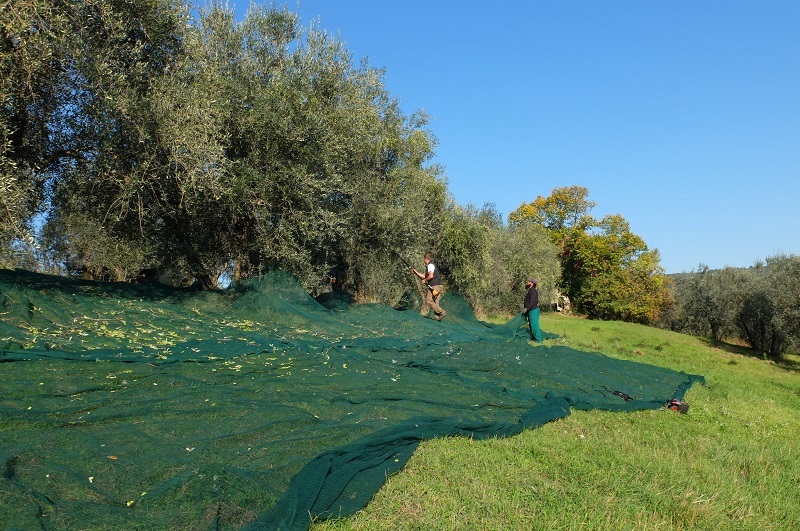 2014 was a really tough year for olive growers in Italy and for Tuscany. Many decided to not produce olive oil that year, especially those who specialize in extra-virgin at the professional level. This challenging year required a lot of professionalism, expertise and attention throughout the year to intervene at the right time. It took determination to continue production keeping in mind you needed more energy and human capital, we continued making oil with a reduction of production of 50%. On the other hand, this past year which was a positive one for us all, saw an increase of people wanting to seek out high-quality extra-virgin olive oil. Many have come to our oil press for the new oil and we love seeing this sort of enthusiasm! For my readers from the USA, how can they get Pruneti oil? Regarding buying our extra-virgin olive oil, all of our production line can be purchased online directly from our website. Otherwise other active online store to the states are here or here. Read ‘Extra Virginity’ by Tom Mueller via Amazon. Before I came to Italy I didn’t really either. In the USA, the kind of olive oil I used to get had almost no flavor and wasn’t that different than Canola oil. It’s a whole new world now! 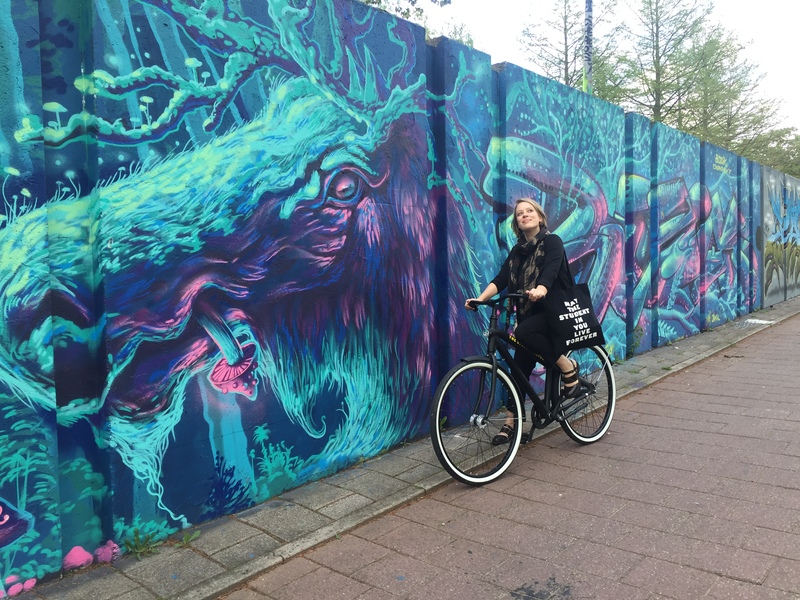 Thanks for this post, Georgetown. We have just this moment come back from Casaloste where everyone in my group purchased their organic EVOO. There is nothing quite so perfetto! Thanks for this post, Georgette. We have just this moment come back from Casaloste where everyone in my group purchased their organic EVOO. There is nothing quite so perfetto!